The event is open to all LSE alumni and close friends of the School. Whether you are a local resident or passing through on holiday or business, we hope you will attend. The event is open to all LSE alumni - places are limited and registration is essential. Tickets are £30 per person (approximately $40), including refreshments and networking receptions. 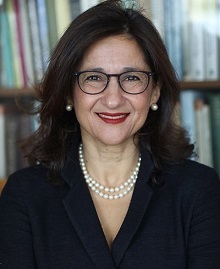 Dr. Minouche Shafik was appointed Director of the London School of Economics as of September 1st, 2017. During her 15 years at the World Bank, Minouche worked on its first ever World Development Report on the environment, designed reform programmes for transition countries in Eastern Europe and developed proposals for economic integration in support of the Oslo peace process in the Middle East. She became the youngest vice-president in the history of the World Bank at the age of 36. Minouche returned to the UK in 2004 and rose to become the Permanent Secretary of the Department for International Development where she was responsible for the UK’s development assistance efforts around the world. She joined the IMF in 2011 as Deputy Managing Director with responsibility for many of the crisis countries in the Eurozone and the Arab countries in transition. She also oversaw the IMF’s university which trains thousands of government officials each year and was responsible for human resources and an administrative budget of $1 billion. From 2014-2017 she was Deputy Governor of the Bank of England responsible for a balance sheet of almost £475 billion and sat on all of the Bank’s major policy committees (the Monetary Policy Committee, Financial Policy Committee, and Prudential Policy Committee). She also led the Fair and Effective Markets Review which put in place a set of reforms to tackle misconduct in financial markets. Minouche currently serves as a Trustee of the British Museum, the Council of the Institute for Fiscal Studies, Governor of the National Institute for Economic and Social Research, and is Honorary Fellow of St. Antony’s College Oxford. She holds honorary doctorates from the University of Warwick, the University of Reading, and Glasgow University. She was made a Dame Commander of the British Empire in the Queen’s New Year’s Honours list in 2015. For questions about this event, please phone 646-442-2895.